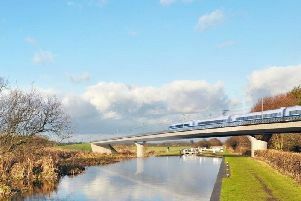 Reading the Your Feedback section (YEP March 20), the reader comments demonstrate the feelings of many who are clearly against the introduction of the Parkway railway station as being a rail link to Leeds and Bradford Airport. There are likely thousands more readers, and other residents, across Yorkshire who undoubtedly feel the so called rail link is not really a link at all. In the YEP on March 18 Liz Truss, chief secretary to the Treasury, warned “too much public money was being spent, ie wasted, on white elephant infrastructure projects”. The Leeds Bradford attempt at a rail link will prove to be yet another LCC ‘white elephant’ and an unbelievably expensive one at that. Having served my country in World War Two I am in utter dismay at the shenanigans of our parliament and government. What a humiliating position we find ourselves in with the unelected representatives of the EU, we must be the laughing stock of the developed world. It at least proves ‘there is no life after death’ and we are close to that. Churchill would be kicking their tail ends out of common complacency. So, the Brexit referendum has become simply a public opinion poll. What a disgraceful display by MPs. If the Germans want to sell their cars to the UK, the Spanish their holidays and the French their food and wine, they should be coming to London to plead for a deal. We hold the winning cards, so why is Mrs May commuting to Brussels to beg for concessions? Can someone please lead us from the front and follow the 2016 decision of the British people. Are we kept in the dark? I THINK people are getting fed up and frustrated over the diabolical handling of the Brexit fiasco. My question would be this - Nigel Farage has given two superb speeches to the EU council telling them what for, and how it should be. Why were none of these masterpiece speeches aired on the national news? Mushrooms spring to mind - keep them in the dark and feed them. Is post Brexit outlook good? Tim Martin’s Wetherspoons pub The Time Piece in Dewsbury town centre is to close. For the last few years customers of this establishment have been bombarded with propaganda promising a better life for Britain outside the EU. However, if the outlook is so good for the country why are Wetherspoons closing pubs around the country? They must know that the prospects for the economy are grim under Brexit. Mr Martin is not alone. Sir James Dyson, the Brexit fanatic, is closing down his British headquarters and is moving to Singapore. He will avoid paying tax in the UK as a result. Anti EU MP Jacob Rees-Mogg’s investment company is opening an office in Dublin to escape some of the repercussions of Brexit. When it comes to these pro Brexit business people, we should see what they do rather than listen to what they say.